Are you searching for a mail address which is temporary? Then it is a known fact that the 10 minute mail app is perfect for this. Today there has been lots of apps developed which has similar features such the 10 minute mail app. Many alternatives are available for you to create a temporary email address. Today security and privacy are the two elements which are considered very important in any app. For secure and safe communications let’s see some of the best alternatives for 10 minute mail. Before examining the alternatives let’s see the importance of creating a temporary email address. 1 Why is the temporary email address needed? Why is the temporary email address needed? The brilliant 10 minute mail app renders mailing services for the users. Many apps today need identification mail address and login information to access any application. Many users want privacy. Without revealing your original email address apps like 10 minute mail will help you to create a temporary mail address. The users who love privacy and convenience find these apps very useful. This temporary mail address will also help you to ignore and get rid of all the spam and bulk messages you receive when logging in a new website or account. This disposal email address will help you to avoid receiving promotional emails and offer notifications. Guerrilla mail is one of the reliable and genuine email providers. It is one of the finest alternative apps for the 10 minute mail. Instantly the user can create a temporary email address with this app, and the user does not need to complete the complicated registration procedures. You can choose a random mail address, or you can do any kind of customization to your email address. This app has been popular since the 90s by providing safe disposal email addresses. The Mailinator is one of the preeminent and dependable temporary mail provider apps. The website available for this app is very simple to use. You can create your disposal email id effortlessly with Mailinator. This app is available with lots of incredible features. The mail suggestion feature is very excellent as it can help users who are confused to choose their email id. All the mail services provided by Mailinator are completely free. If you want more email addresses for your enterprise, then you can test all the email addresses. For your single mail address, there are several mailboxes available in this app. Maildrop app is the perfect alternative available for the 10-minute mail app. The Maildrop app works similar to that of Mailinator within seconds you can create an id. The app can help you to create unique mail addresses and give complete liberty to the users to choose their favorable mail address. All the mail addresses can be created with a domain name of Maildrop. Maildrop app is an open source platform, and all the services are available for free of cost. This app tries to reduce all the spam and to provide a maximum safe and secure platform. 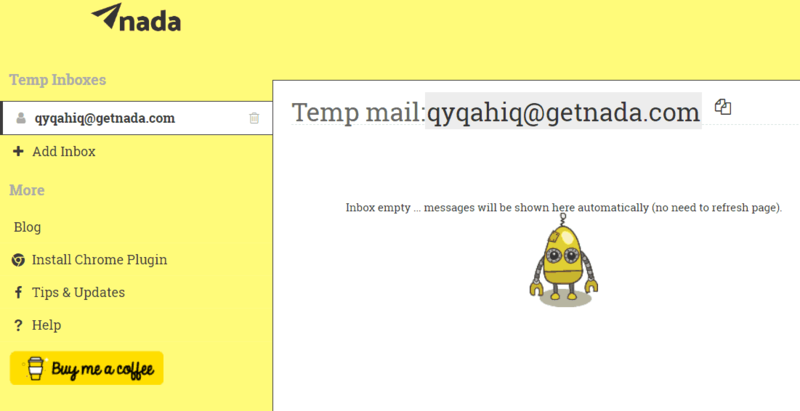 This fake mail generator is deemed the most suitable and convenient email address maker for a temporary period. It can be used as the 10-minute mail which can successfully help you to reach the goals for which it was created. You can use this 10-minute mail as the alternative where you can create random emails that contain many dissimilar domains. If for instance, you do not like the mail that is generated there is a service which can make another set of emails when you get to the page. If you have very little time and in a hurry, the website will give you an address which will come as the ‘copy’ button. You can stick that in the other platforms with ease. Using this fake email is an easy and convenient way to perform these tasks. It is the email address deliverer for temporary usage that is like the 10-minute mail for getting famous. It will make your job really easy. It even grants you the opportunity to create your self-made email address and gives it an approval if it is like @dispostable.com. You can use this not for long email address creator that does not suggest any names. The flaw is that the generator is not working for a time being. However other than this the generated email addresses can be used instantly. You have to just put the mail of your choice and choose the checkbox. This is a simple and superb website which has the capability to make random email addresses for you. It is a famous 10-minute mail alternative. You have to click the get temporary email option which is located at the primary part and this will guide you to the casually generated inbox. This will provide you with the comfortability to alter your email addresses as you prefer. This will include the ones with attractive domain names like @getnada.com. This service is really easy to use. This is a reputed and well-known email address service provider that works differently than the other email generators. This will actually generate a fake email whenever you come, and this can also be modified later. You will be given an email inbox that will be connected with the specific email address. On the website, the menu on the left will provide you functions such as making a copy of the email address, modification or elimination of the address and refreshing the inbox. The incognito mail helps you to register on the other websites if you do not want to use your own email address. It can be used as the 10-minute alternative which is secured, temporary, disposable and anonymous variety of email addresses. It will be useful for 60 minutes but after that, it will be deleted. This is sufficient time for downloading the link, replying and verifying. 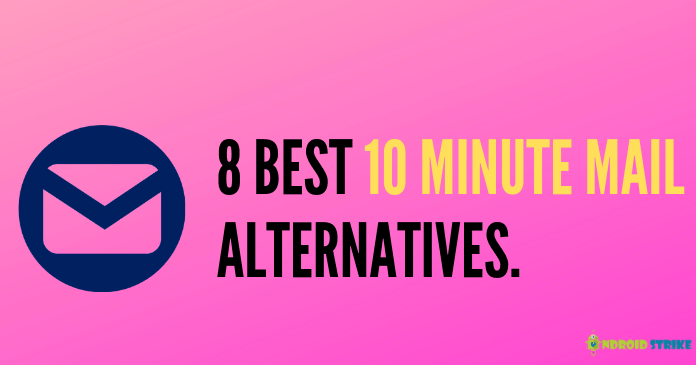 These are the best 10-minute mail alternatives. If you are in need of disposable and temporary email addresses, these are the suitable ones to use. I hope you liked this article, Don’t forget to share this article with your friends and family members. If you found any other best alternative then just let me know in the comment section below. vijaygopal balasa is a tech avid and digital marketer. He likes to write and share about apps, games, gadgets, smartphones and Tech Reviews. He is a Blogger, Half-Geek, Half-Nerd.